Deal 5 damage to your opponent and gain 5 health. Drain Life is a legendary Endurance action card. 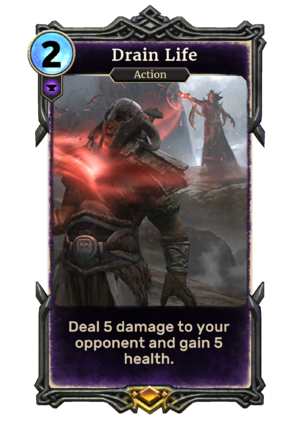 Like other Blood Magic Spells, the card is based on a vampiric ability from Skyrim's Dawnguard add-on; in this case, vampires' ability to drain life.